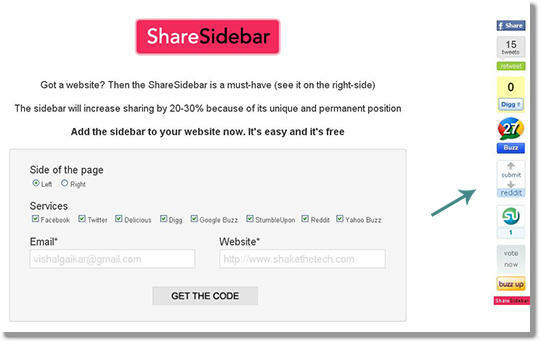 ShareSidebar contains collection of popular social media sharing buttons which you can add to the sidebar. Social Media Buttons including FaceBook, Twitter, Delicious, Digg, Buzz, StumbleUpon, Reddit and Yahoo Buzz. The best thing is that you can decide whether to put them all or just some of them. The sidebar will increase sharing by 20-30% because of its unique and permanent position. You can even choose the position of the sharesidebar that where it appears on your blog whether the right or left of the site. To obtain an embed to be installed in a blog or website, you must leave a valid email address and, of course, enter the URL of the domain in which you want to show. The buttons shown are typical of social media now widespread in many web 2.0 sites are greatly appreciated by visitors for content sharing in social sites. This Sidebar is fixed on the screen, so when the reader scrolls, it is always visible to more practical use.Also Read Get Highly Relevant Adsense Ads On Your Blog!